Melt the butter in an ovenproof skillet over low heat. Peel the apple, and hey, pop the peels in the toaster oven for crispy apple sticks, chop up the apple, and toss it in the butter. Saute until softened, about five or ten minutes? Beat together the eggs, flour, and milk, and you know what's great for this? My rocket blender that I use for smoothies, blend for thirty seconds. Pour the eggs over the apples in the pan. Bake for 25 minutes. Run a heatproof rubber spatula around the edges and under the clafouti to release it from the pan (or ramekins). 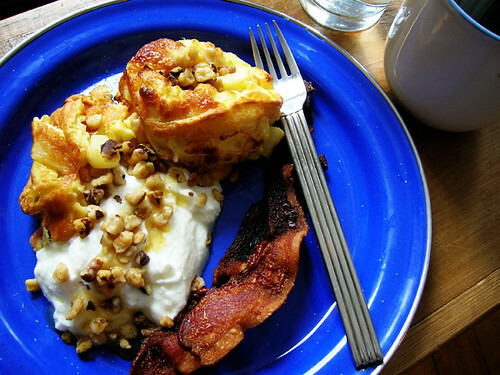 Serve with a scoop of greek yogurt, a sprinkle of nuts, and a drizzle of maple syrup. omg so i made bacon on the cookie sheet, and i poured off the bacon fat into a tiny glass and put sweet potatoes on the cookie sheet to put in the oven, and i fix my breakfast and i'm like, there's one for you in the kitchen, and some walnuts and maple syrup and bacon, and i just went into the kitchen to do the dishes and the tiny glass is empty! and i'm like, what do you think was in this glass? and he goes, maple syrup? and i'm like, NO. and he's like, well it was good.